Cable used as transmission medium in Railway signaling contains copper conductors with proper protective metallic or PVC sheathing /screening. The type , size of conductors, number of conductors etc depend on the specific requirement and is to be decided at the design stage. 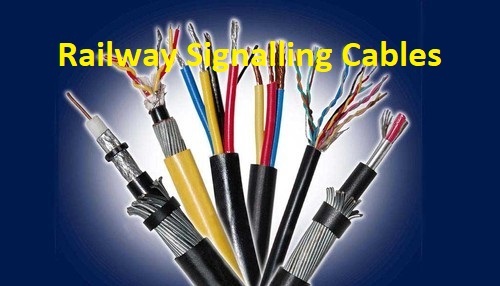 The specification as per the above Standard, stipulates that the insulation of the signaling cable should be either elastomer or ZHLS (Zero Halogen Low Smoke) and the conductors should be of tinned annealed copper. The maximum voltage rating shall be 650/1100 volts being power frequency rating to earth and 1100 volts being the core- to -core rating. Cables shall be suitable for use in D.C. circuits where the nominal voltage to earth does not exceed 1100 volts. Cables with cores comprising stranded conductors, insulated with flame retardant ZHLS compound. Cable can be single core with insulation only(A1 type), single core with ZHLS oversheath (A2 type), or multi core with ZHLS sheath(A3 type). Cables with stranded conductors and insulated with Ethylene Polypropylene Rubber(EPR) and with sheathing of HDCP (Heavy Duty PolyChloroprene) sheathing. Shall be of copper wire, circular tinned, annealed, and of high conductivity. When alterations to the existing installations are taken up, it may become necessary to replace the cables laid long back. Cable types in drawings issued prior to 1986 are referred as MC1, MC2,MD1, MD2,MF1,MF2 etc. So, the type and size of the existing cables may not match with the provisions in RT/E/PS/00005 and so the equivalent type and size are to be quoted from the new Standards. Going for such equivalent becomes applicable in cases of cable replacement due to maintenance, fault rectification and no stock of the cable indicated in a design etc. Type C (or E) Cable should be used in all cases of track equipments and in similar circumstances involving track vibrations. Where fire performance characteristics are mentioned, (eg. ZHLS), cables of type D and E should be used in lieu of type B and C respectively. Number of cores of the cable proposed for replacement should be equal or greater than that specified on the site diagrams. Spare cores should be terminated as per the site wiring diagrams or insulated in accordance with provisions in RT/E/C/11210 (App 1D20). Type D3 or MD3, five core cables are specified for emergency replacements only. Type C cable being of very heavy duty construction is suitable for use as tail cable , but not to be used for long term underground purposes.